Aleksandr Solzhenitsyn has taken another chance with post-Soviet television. After his return to Russia in 1994, he appeared on television over 40 times in his own talk show, which was cancelled by the ORT channel in September 1995. 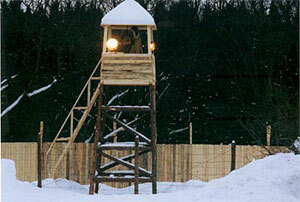 Now, in January of 2006, the Rossiia (RTR) television channel broadcast a 10-episode miniseries based on Solzhenitsyn’s novel The First Circle. This adaptation is the first Russian screen version of a work by Solzhenitsyn, who wrote the screenplay for the series and provided the voice-over narration. Solzhenitsyn finished the novel in 1958 but could not publish it even in a self-censored version. The novel circulated in samizdat throughout the 1960s, until it was smuggled out of the USSR and published in the West in 1968. Only in 1990, during Mikhail Gorbachev’s perestroika, did The First Circle come out in Russia. Insofar as an adaptation of a literary classic can be judged by both the accuracy of transferring the original work onto the screen and the ability of the production to stand on its own, The First Circle is a definite success. The series was directed by veteran filmmaker Gleb Panfilov, whose Soviet-era films (No Ford through Fire [V ogne broda net, 1967]; I Want the Floor [Proshu slova, 1975]; The Theme [Tema, 1979])—all of which deal with life choices—make him eminently qualified for the job. Like all of Panfilov’s films, The First Circle features the director’s wife and permanent female lead Inna Churikova, although in the miniseries she figures only in one episode as the withered and desperate wife of one of the prisoners, a role for which she received a Russian TV Academy (TEFI) award. Evgenii Mironov appears as Gleb Nerzhin—Solzhenitsyn’s alter ego in the novel—and was reportedly handpicked for the role by the author himself, perhaps after Mironov’s success in the role of Prince Myshkin in the TV adaptation of Dostoevskii’s The Idiot (dir. Vladimir Bortko, 2003). Mironov looks quite organic in the role of a mathematician-turned-historian who refuses to participate in the research that benefits Stalin’s state and instead chooses death in a prison camp. Even with the TV-friendly script, however, The First Circle belongs more to the respectable Soviet genre of “literary readings” (literaturnye chteniia) than to the television drama. To those who are not familiar with Solzhenitsyn’s fiction, the adaptation offers a painstakingly detailed if somewhat castrated, version of the novel. The series is accurate in historical detail, it follows all the plotlines, and it delivers its coherent anti-Stalinist message. As in all of Solzhenitsyn’s fiction, the narrative of The First Circle is organized neither around events nor around people as individuals but around people as types and a community as a sum total of these types. This allows for the classically-structured works (one day—one camp; four days—one sharashka) to expand both time and space indefinitely. From the intermingling of descriptions, inner monologues, flashbacks, and conversations that occur over several pages, a complex picture of Stalinist society emerges. This picture is not entirely contained―either by the author’s professed knowledge of the truth or by the binary oppositions that can be easily drawn from any individual scene in the novel. Each episode in the series has a clear dramatic center with its own protagonist. The first two episodes focus on the MGB chief Abakumov (Roman Madianov) and Stalin (Igor' Kvasha), the third on Volodin (Dmitrii Pevtsov), the fourth on Nerzhin, and so forth. Out of necessity, the screenplay only retains the text that is vital for the character, yet most of the scenes are static and drawn out. The choices Solzhenitsyn made in shortening the novel are clearly designed to bring out certain themes in the most user-friendly way possible. For example, Abakumov’s conversation with the old prisoner Bobynin and with Stalin, as well as Nerzhin’s, Sologdin’s and Rus’ka Doronin’s flirting with the free women at sharashka, are all reproduced verbatim. While the former two scenes illustrate the opposition of moral strength and fear, the latter three exemplify the theme of normal people in abnormal circumstances. All these scenes are impeccably acted and shot, with nothing false, sloppy or annoying—and nothing new or original either. This is not the fault of the filmmakers or the author. It is just that The First Circle came a little too late. For the past fifteen years, Stalinism, in all of its shocking, melodramatic, and atmospheric potential, has been the menu item of choice for Russian cinema and television. The script, however, retains very little of the characters’ heated ideological debates. Granted, the television series is a problematic genre for such discussions. Yet, some changes are indicative of the problem beyond mass medium considerations. For example, as some critics have noted, in the screenplay Nerzhin secretly composes poetry, while in the novel he writes his reflections on the nature of the Russian revolution: “For a mathematician, there is nothing unexpected in the history of 1917. At ninety degrees, tangent soars towards infinity and immediately plummets into the abyss of minus infinity. Russia too, having soared for the first time towards unseen freedom, immediately plunged into the worst of tyrannies” (Solzhenitsyn 36). In fact, the most interesting aspect of the novel is the clashing of viewpoints. This is a surprising quality in an author whose works are as “anti-dialogical” as they come. But Soviet ideology was a formidable opponent, which Solzhenitsyn treats not only as a target, but also as interlocutor. In a way, all characters in the novel are dissidents [inakomysliashchie], beginning with Nerzhin and ending with Stalin. 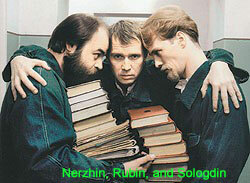 In the novel, Nerzhin (a self-taught skeptic), Rubin (a staunch Marxist), and Sologdin (a Slavophile) are irreconcilable ideological opponents. In the series, they are primarily friends. Apparently, in today’s Russia, the “frontline brotherhood” and the adolescent “buddy” paradigm is more popular and attractive than the confrontation of ideas that are relevant only to your own sense of truth—but not to your ratings or public image. Solzhenitsyn is an original writer and a free thinker. To quote Bulgakov’s Korov'ev, “Just take any five pages from any one of his novels and you’ll be convinced, without any identification card, that you are dealing with a writer” (353; emphasis added). Or without a TV adaptation. The First Circle is a well-made historical series. No less; no more. It is also a tribute (to the author) and a poster child (of post-Soviet liberalism)—both “genres” antithetical to television aesthetics, unless one is willing to take liberties and pay the price. The director (at age 71) and the scriptwriter (at age 87) were perhaps unwilling to take risks. Or possibly, they assumed that the text speaks for itself. The problem is that in contemporary Russian media, talk shows have far outstripped Solzhenitsyn in aggressive political duels, while historical shows have, in waves, already denounced Stalinism. Meanwhile, all signs have indicated that the release of The First Circle was an important cultural event. Moscow streets were decorated with billboards advertising the series and its legendary scriptwriter. Dozens of reviews appeared upon the series’ release, which was also noted by the Western media. In the wake of the broadcast, the publishing house Time (Vremia) released the first three volumes of their projected 30-volume Collected Works by Solzhenitsyn. The print run—three thousand copies—is quite modest, if perhaps realistic. The RTR channel broadcast The First Circle without commercial breaks, losing money but gaining cultural capital through the repeated references to its patriotic generosity. Anton Zlatopol'skii, the general producer of the channel (and of the series), declared that all citizens of the Russian Federation must watch The First Circle (quoted Khlobystova). In its official support, symbolic significance, and cultural irrelevance, the adaptation of The First Circle competes with the cult classic of Brezhnev-era Soviet television, Tat'iana Lioznova’s Seventeen Moments of Spring (Semnadtsat' mgnovenii vesny, 1973). Both are television historical dramas that have more metaphoric potential than they are willing to admit. Both use an authoritative voice-over, maintain a lethargic pace, and address the issue of people vis-à-vis the imperial power. But while Lioznova’s series appeared in the collapsing Soviet empire, which had the benefit of irony, The First Circle is monopolized by a rising power that does not squander the hegemonic potential of the great myths of the past. Judging by the TV schedule, the production of classics is a well planned “campaign.” The Five Year Plan of 19th-century classics opens with The Idiot and continues with Anna Karenina (dir. Sergei Solov'ev, 2005); Hero of Our Time (Geroi nashego vremeni; dir. Aleksandr Kott, 2005); and The Brothers Karamazov (dir. Iurii Moroz, planned for release in 2007). 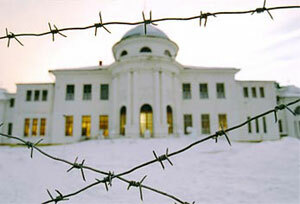 The 2005-2006 seasons were dedicated to forbidden Soviet novels and controversial authors. In addition to the widely advertised First Circle, Master and Margarita (dir.Vladimir Bortko, 2005) and Doctor Zhivago (dir. 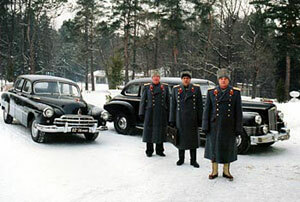 Aleksandr Proshkin, 2006), viewers were treated to Moscow Saga (Moskovskaia saga; dir. 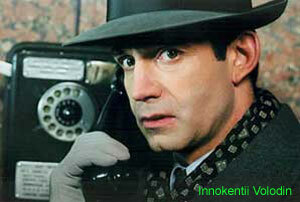 Dmitrii Barshchevskii, 2004), based on a novel by Vasilii Aksenov, and Esenin (dir. Igor' Zaitsev, 2005). It is no wonder that, to a journalist’s diplomatic question, “Don’t you consider it a dissonance that a state TV channel adapted such writers as Mikhail Bulgakov and Aleksandr Solzhenitsyn, whose relationship with power structures were, to put it mildly, rather complicated,” Anton Zlatopol'skii answered: “I don’t see any contradictions here. Moreover, I consider the creation and transmission of such projects the most important function of state television” (quoted Stepanova). Indeed, criticism of Stalinism and communism is a staple feature of post-Soviet television. The state has shed its old Soviet identity as easily as it morphed from Stalin to Khrushchev to Brezhnev—denouncing the predecessor in the process. Bulgakov, Pasternak, and Solzhenitsyn may have as little in common as Nerzhin, Rubin, and Sologdin. Yet they coexist in the media space as signs of national conciliation and imperial revival. Their works have been canonized, and the writers themselves—tortured, humiliated, or killed by the state—have been instated into the pantheon of Great Russian Literature. The spectacle of democracy has an extra advantage of impressing the West. The New York Times reports that the leader of the Communist Party of Russia, Gennadii Ziuganov, “denounced the series as ‘an absolutely sideways glance at Soviet history.’ Others drew unflattering parallels to recent events, from to the conviction of Mikhail B. Khodorkovsky … to political attacks on human rights organizations… At least [the series] prompted debate”—concludes the reviewer (Myers). Debate is indeed possible, but only if The First Circle is interpreted as a criticism not only on Stalinism but of an imperial state mentality (imperskaia gosudarstvennost'). Buried somewhere in episode five of the series, uncle Avenir quotes to Volodin the famous words of Aleksandr Herzen: “Where are the limits of patriotism? Why should love for the motherland be extended to the government? Why should one help it to continue destroying the people?” To my knowledge, only one review―in The Literary Gazette―took on the challenge of these words: “According to the author and the makers of the TV series, then, patriotic feeling should resemble a weather-vane and change its vector depending on political conditions. Say, you wake up in the morning, turn on the radio, and, after listening to the news, decide, whether to love your fatherland [otechestvo-sic!] or not, to work for its benefit or against it” (Kaznacheev). Solzhenitsyn’s idea is conveniently twisted in the spirit of new Russian patriotism. In November 2006, The First Circle received the annual Russian television award as the best TV production of the year, beating both Master and Margarita and Doctor Zhivago. As critic Iurii Bogomolov notes: “It is not so much Solzhenitsyn who needs TEFI; it is TEFI that needs him for its own prestige.” And, we might add, a live classic is clearly an asset for the “new Russia.” Ironically (or not), Solzhenitsyn’s criticism of communism has one practical benefit: after all, the Communist Party is one of the very few organized oppositions to Putin’s regime that is allowed. 2] See, for instance, Myers. 3] Anton Zlatopol'skii recounts that the big dilemma in the production process was how much to pay Solzhenitsyn for the script: “It was not so much about the sum as about the approach: what kind of royalties would be appropriate considering the status [masshtab lichnosti] of the scriptwriter?” (quoted in Stepanova). Bogomolov, Iurii. “TEFI-2006. Moi vybor.” RIA-Novosti (11 December 2006). Bulgakov, Mikhail. Master and Margarita. Trans. Richard Pevear and Larissa Volokhonsky. NY: Penguin Books, 1997. Kaznacheev, Sergei. “Zakliuchennye v limbe,” Literaturnaia gazeta 6 (2006). Khlobystova, Liudmila. “Krug pervyi, popytka tret'ia.” RUTV.Ru (19 January 2006). Leshchinskii, Ivan. “O romane V kruge pervom, ego ekranizatsii i sovremennom znachenii”, Scepsis. Myers, Steven Lee. “Toast of the TV in Russian Eyes: It’s Solzhenitsyn.” The New York Times (9 February 2006). Solzhenitsyn, Aleksandr. V kruge pervom. Vol. 2 of Sobranie sochinenii v deviati tomakh. Moscow: Terra, 1999. Stepanova, Nadezhda. Interview with Anton Zlatopol'skii. Izvestiia (31 January 2006).